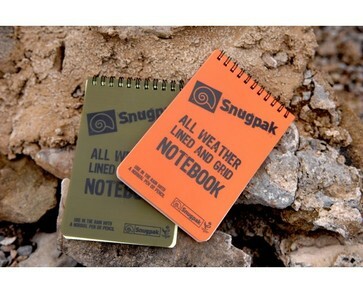 The trusted Snugpak ® Water Resistant Notebook is an often overlooked item of equipment, for any day trip, venture or expedition. The need to write down information in an emergency is often disregarded in this day of smartphone technology, but the lined and gridded pages of this little Notebook ensure that information from Grid References to a time-critical ETHANE report for the Rescue Services can be completed easily and quickly. Ideally to be used with a 2B Soft Pencil, this water-resistant paper can be used with a range of weather resistant pens in inclement weather.